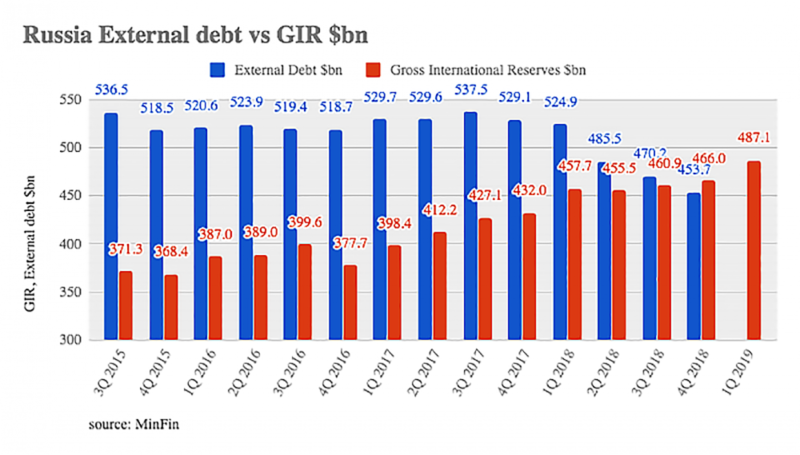 Russia’s gross international reserves (GIR), including gold, continue to creep upwards and reached $487.1 billion as of March 22 — enough to cover Russia’s external debt dollar for dollar in cash. At the end of the last quarter of 2018 Russia had an external debt of $453.7 billion and the debt has been falling steadily over the twelve months as the government makes use of the windfall from rising oil prices and falling expenditures to pay off more debt early. Russia already had one of the lowest levels of debt of any major country in the world. While most western countries have debt to GDP ratios well over the Maastricht rules recommended maximum of 60% (and some like Italy are well over 100%), Russia’s debt to GDP ratio has been hovering around 15% for years. At the start of 2016 Russia’s external debt was $520 billion and it rose to a high of $537 billion in the third quarter of 2017, but it began to taper off quickly as 2018 got underway. The falling debt is part of the Kremlin’s strategy to sanction-proof as more financial sanctions are expected to be imposed this year. The Defending American Security Against Kremlin Aggression Act (DASKAA) sanctions that could target Russia’s sovereign bonds are supposed to be read by the US Congress in April. 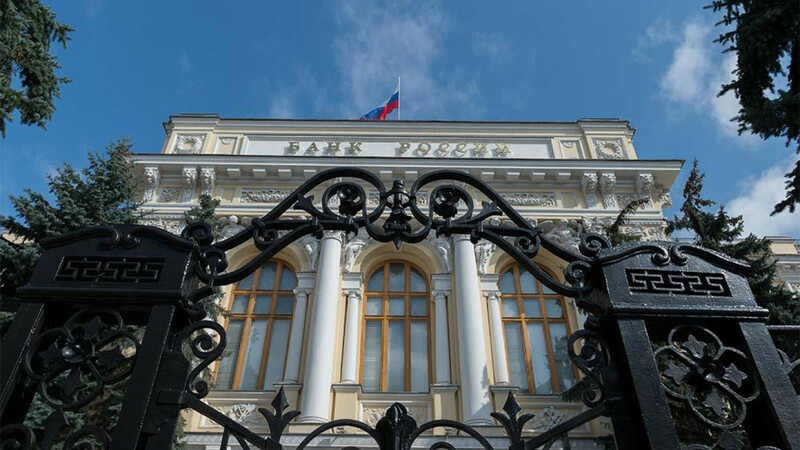 The Central Bank of Russia (CBR) has also taken preventative measures including slashing its holdings of US Treasury bills and Russia has been actively building up gold as a share of its GIR since 2007. A “financial fortress” had been built that makes it very difficult to pressure the Kremlin, but it comes at a cost. With the emphasis on stability over prosperity investment has been below par and the economy underperforming. Despite Russia’s growing cash pile of reserves real incomes in Russia fell again slightly in 2018, down for the fifth year in a row. Now the economy has been largely insulated from the dangers of more sanctions the Kremlin is turning to the growing discontent and has launched a massive social and infrastructure investment plan that is supposed to “transform” Russia and improve lives as outlined in the May Decrees and the RUB25.7 trillion ($390bn) investments planned for the 12 national projects. The jury remains out on whether this will be enough to see GDP growth accelerate to over 3% in 2021, which is the short-term goal.